Big Thunder Events offers Schools and Churches a special pricing structure with the rental of three or more inflatable units. We understand that you are providing a valuable service by teaching the children, they after all are our future. We give a percentage off of your event to help you with the costs of providing a day of enjoyment and reward for the children that you have dedicated so much of yourself to. 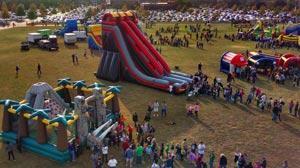 Hundreds of Schools and Churches trust Big Thunder Events to provide the most amazing equipment and services for their events each and every year, whether you are a returning client or a "new to us" client, you deserve the very best in service and entertainment for your festival or carnival. We will even help in the planning of your event to help you get the most out of your budget and we can even assist you with many tools and ideas to help raise funds for events or whatever you may need.